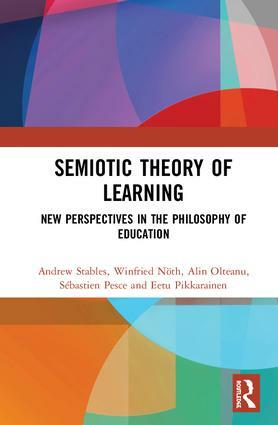 Semiotic Theory of Learning asks what learning is and what brings it about, challenging the hegemony of psychological and sociological constructions of learning in order to develop a burgeoning literature in semiotics as an educational foundation. Drawing on theoretical research and its application in empirical studies, the book attempts to avoid the problematization of the distinction between theory and practice in semiotics. It covers topics such as signs, significance and semiosis; the ontology of learning; the limits of learning; ecosemiotics; ecology and sexuality. The book is written by five of the key figures in the semiotics field, each committed to the belief that living is a process of interaction through acts of signification with a signifying environment. While the authors are agreed on the value of semiotic frameworks, the book aims not to present an entirely coherent line in every respect, but rather to reflect ongoing scholarship and debates in the area. In light of this, the book offers a range of possible interpretations of major semiotic theorists, unsettling assumptions while offering a fresh, and still developing, series of perspectives on learning from academics grounded in semiotics. Semiotic Theory of Learning is a timely and valuable text that will be of great interest to academics, researchers and postgraduates working in the fields of educational studies, semiotics, psychology, philosophy, applied linguistics and media studies. "An increasingly important and complex concept in society, "learning" is raising new questions and challenges within research. As partial as I may be, here, I feel that semiotics is properly equipped to crack at least a few answers – which, alone, is a good reason to engage into the reading of this monograph. But there is more. The five authors reflect the current landscape of edusemiotics in diverse yet complementary ways, producing a "pentagon" of approaches that is convincing in terms of competence, originality and argumentation. An excellent piece of work!" Prof. Dr. Dario Martinelli, Director of the International Semiotics Institute. Andrew Stables is Professor Emeritus in Education and Philosophy at Roehampton University, London and a Senior Researcher at the International Semiotics Institute, Kaunas Technological University, Lithuania. Winfried Nöth is currently based at the University of Kassel in Germany. Alin Olteanu is a Postdoctoral Researcher at Kaunas University of Technology, Lithuania. Eetu Pikkarainen is currently a Lecturer in the Faculty of Education and Open University of University of Oulu, Finland. Sébastien Pesce is Assistant Professor of Educational Studies at the University of Tours, France.